Sequoia was found living under a shed with her 5 pups. Sequoia was in terrible condition and was brought to New Hope Dog Rescue Sept 5, 2015. She was taken immediately to a veterinarian and it was discovered that she had a very bad Demodex infection. This is a mite that burrows into the skin. Luckily it is not contagious but in malnurished animals with poor immune systems, it can have devestating results. The good news is that Demodex is easily treated. We had to wean Sequoia’s puppies a little early (6 weeks of age) but they all did extremely well and they were adopted! 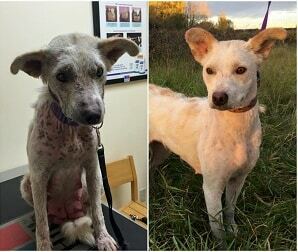 After one month of treatment, Sequoia was ready for adoption. She was so sweet and loving, it did not take long for someone to fall in love with her.